Once a man came to the prophet Muhammad (S) and said, “Oh prophet of Allah, I have many bad habits. Which one of them should I give up first?” The prophet said, “Give up telling lies first and always speak the truth.” The man promised to do so and went home. MAKE A PROMISE: I SHALL ALWAYS SPEAK THE TRUTH. A person’s example is much more powerful than just his words. When we ask someone to do something, we must do it ourselves also. We should not ask others to do what we do not do ourselves. ALWAYS MAKE SURE THAT YOUR ACTIONS AND YOUR WORDS ARE THE SAME. Prophet Dawood (as) was a prophet of Allah (swt) and a king. He had nineteen sons and every one of them wanted to inherit his throne. He agreed with one of his wives to nominate their eldest son to the throne. Allah (swt) commanded him not to appoint anyone, but to wait for His order. One day, he was asked to decide in a dispute between Elia, who was a cultivator, and his neighbor, Yohanna, who was a herdsman. Elia complained that the sheep belonging to Yohanna had grazed in his cornfield and had eaten the vegetables, causing him a great loss. Yohanna admitted that it had happened at night while he was asleep. By the command of Allah (swt), Prophet Dawood (as) called all his sons and told them that whoever decided the case correctly, would become his heir. Sulayman / Solomon (as), who was the youngest son, ruled that Yohanna would have to surrender to Elia the milk and the wool that he would obtain from his sheep during that year. Prophet Dawood (as) asked him how he had decided in this manner. Allah (swt) informed the Prophet Dawood (as) that the ruling given by Sulayman (as) was the best and he should be made his heir. Dawood (as) gathered all his sons in the presence of the learned people and chiefs of tribes and declared, by Allah’s command, Sulayman (as) to be a prophet of Allah (swt) and his heir to the throne. Prophet Dawood (as) died and Sulayman (as) became a king at the age of thirteen. Once, the Prophet Sulayman (as) said that he would have a son from each of his wives. Since he did not leave the fulfillment of his desire upon the will of Allah (swt) by saying Insha Allah, only one of his wives bore him a child, and even then, it was stillborn. When Sulayman (as) realized his mistake, he became very sorry and asked Allah (swt) to forgive him and to grant him a kingdom which no one else would have after him. Allah (swt) accepted these prayers and granted him a mighty kingdom. He also gave him power over the Jinn’s, birds, animals, and the wind. They all had to obey his orders. Allah (swt) also taught Sulayman (as) the languages of every living creature on earth. At the command of Sulayman (as), they built huge temples, fortresses, towers, palaces made of glass, large basins of water reserves, and immovable cooking pots. Don’t Forget the Might and Glory of Allah in any Circumstances particularly when you face so-called World Powers. Once, Prophet Sulayman (as) and his army of Jinn’s and animals were passing over the valley of the ants. Seeing the pomp and glory of the army, the chief of the ants alerted all the ants to get into their holes so that the army would not trample over them. With the help of the wind, Prophet Sulayman (as) heard what the chief of the ants had said. He smiled and ordered his army not to move forward until the ants had got into their holes. In spite of his wealth, glory, and vast empire, Prophet Sulayman (as) remained a humble and devoted servant of Allah (swt). He spent his nights in prayers and fasted during the days. He used his power and might only in the way of Allah (swt) to bring humankind to the right path. For his livelihood, he used to make baskets and sell them in the market; and with the money he obtained, he bought food and shared it with the poor. Shortly after that, Hudhud arrived and told Prophet Sulayman (as) that he had flown over the land of Saba (Sheba) where he had seen a beautiful woman ruling over the people. Her name was Bilqees. She had plenty of wealth, a strong army and a throne made of gold, diamonds and other precious stones. He saw her and the people worshipping the sun, instead of Allah (swt). Prophet Sulayman (as) was very pleased with Hudhud and gave him a letter to deliver to Bilqees. Hudhud flew to the land of Saba and dropped the letter in the lap of Bilqees while she was in the palace. When Bilqees received the letter, she called her advisors and said, “I have received an honorable letter from Sulayman. It begins In the name of Allah, the beneficent, the merciful and it reads: “Accept Allah (swt) and worship only Him. I am his prophet, believe in what I say and accept my command”. Prophet Sulayman (as) then married Bilqees and thereafter she returned to her land, where he visited her frequently. The people of Saba who were sun-worshippers, were converted to believe in Allah (swt) and to worship none other than Him. Prophet Sulayman (as) said, “Then allow me to go home to prepare for death and rest on my bed”. The Angel said: “No”. While Prophet Sulayman (as) stood leaning on his staff, his soul left him. His body remained standing for such a long time that the people and the Jinn’s believed him to have become a spirit or a magician. They carried on with the work entrusted to them by Prophet Sulayman (as), until Allah (swt) caused the ants to eat away the staff he was leaning on and his body fell to the ground. 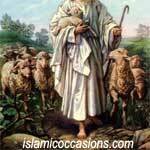 Prophet Sulayman (as) ruled for forty years and died at the age of fifty-three.